Style Hunter: Chic Work and Laptop Bags | Save. Spend. Splurge. My previously coveted brand for laptop bags was always Acme Made because they had such pretty colours and fabrics but I went to their site lately and it was mostly cases for laptops and so on. Oh well. I’ve been using a vintage Cole Haan laptop bag I bought a few years ago from a consignment shop for $300. It was (and still is) in excellent condition in a beautiful cognac colour, and I couldn’t be happier. My laptop bag is not padded, but it has little gold feet on the bottom and a compartment for the laptop itself, and another section for pens and so on. It’s probably meant for me to carry with a laptop in a neoprene case of some sort so that it’s protected, but I don’t bother and I just put my work laptop in there, tout seul. It also holds a lot and expands. Another brand that was recommended for chic laptop bags was Lo & Sons, but to be honest, they are rather big and bulky to be an everyday work bag. I am also not thrilled about their customer service (or lack thereof) and their slightly mercenary attitude when it comes to dealing with customers. It also tips over and folds awkwardly if you overstuff it or don’t put conventional items in it, like a flat laptop, flat book, etc. The bag is too big for the type / size of the handles. For that price, you’re better off getting an all-leather bag. If you want a super light bag that is pretty sturdy to carry about a 13″, 15″ MAX laptop in it, I highly recommend Longchamp Pliage bags. They look flimsy and have absolutely ZERO padding but if you want the lightest bag possible that is still chic, waterproof, and able to be used outside of a conventional work setting, they’re a go-to staple for me. Even comes in leather for the fancier version. Just don’t set it down roughly on the ground and be careful. It’s pretty good as a lightweight bag that will hold a laptop without snapping. 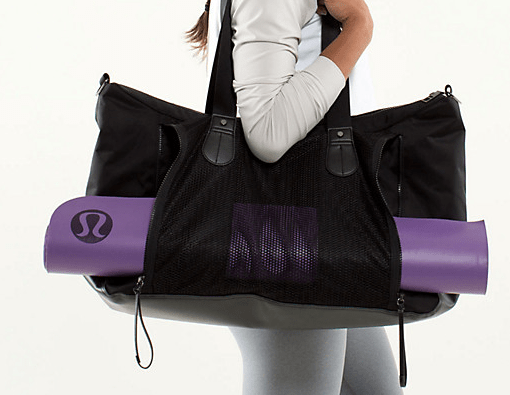 A bag I would NOT recommend for laptops are any kind of Lululemon bags. They look big enough and like they can handle the weight, but they really can’t. Another brand that all businesspeople and travelers seem to rave about (myself NOT included) is TUMI. There is something about the brand I can’t get behind. Either with how heavy their travel luggage is, or the style.. but there’s something a little off and I can’t quite figure out why I don’t love them. Anyway, I did find this cute laptop bag, but they mostly only have black nylon bags. Yawn. If you want a chic-looking backpack, Everlane makes one that looks pretty nice for $65, made out of cotton. I also wouldn’t rule out going to Best Buy, Future Shop or Staples to look at their laptop bag offerings. 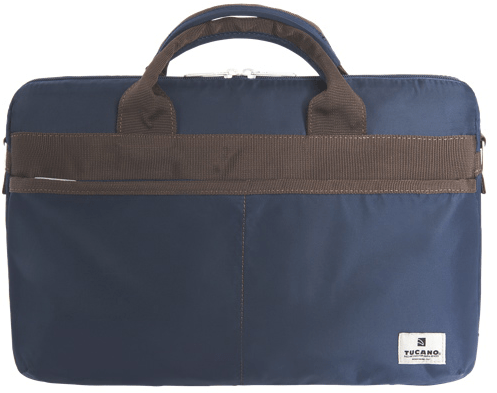 I own a green one from Tucano Milano from Best Buy and it is a fantastic, ballistic nylon laptop bag that is very light for its size and full of padded compartments. Of course it’s not as chic or as stylish as my Cole Haan leather one, but it does the job. Otherwise, the best way to find a chic laptop bag is to constantly keep your eyes peeled for one. I go into travel stores, I visit independent stores, artisans.. you name it. I’m always on the hunt for a nice looking bag especially one that has a zippered top and can carry a laptop to boot. 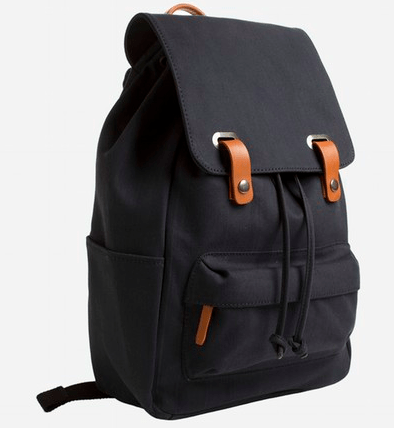 I love the look of that Everlane bag, reminds me of Herschel! I’m slowly gravitating towards clean lines as of late. I have a Tookata people laptop bag but I don’t use it all the time (beautiful bag with cool artwork but I noticed the straps are starting to separate from the bag and although almost a decade old, it wasn’t used or overfilled enough to cause that). It’s a bit funny that back in the 90s I got rid of all my beautiful lady briefcase bags from Coach (had a gorgeous cognac one) when we started using laptops. No need for a brief bag when lugging a laptop bag around too. Now that laptops are so thin, those brief bags could easily serve as a laptop bag (& I see many vintage ones like mine being sold as such). I typically just use a laptop case now and a pouch for all the cables, etc and throw both into any large enough bag. But I don’t lug it to work like you do. My laptop mainly goes to tech meetups a few times a month (wordpress/social media).If I had to carry it on a work commute, I’d probably want a dedicated bag. I most often use my Hayden Hartnett Ibiza tote or my Dooney & Bourke Florentine The Smith bag.Or sometimes I just carry the laptop case like a book and a shoulder bag for everything else. Love your vintage Cole Haan bag–good eye to have spotted it at the consignment shop! 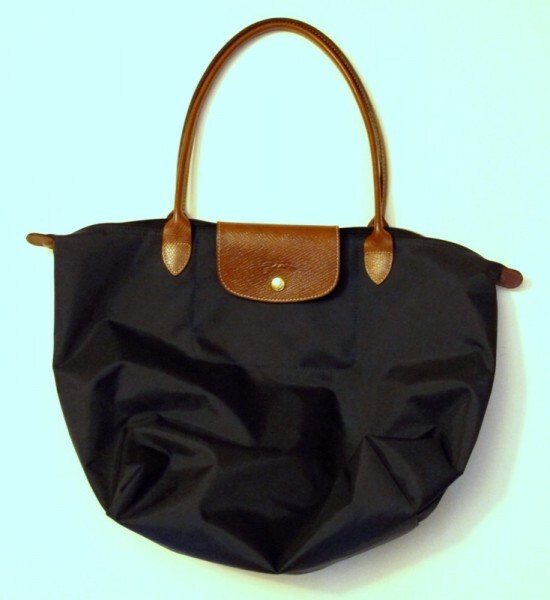 Wondering if you have a vendor you’d recommend for Le Pliage bags? Love them too, but hesitate to take the plunge…! Great suggestions. I’ve been using a Lo and Sons OMB bag since January. Works quite well to carry my huge lenovo laptop, a water bottle, lunch, makeup bag, umbrella, book for the subway and other bits for school/work. It keeps its shape while also being capable of holding lots of stuff, I’ve never had trouble with it toppling over. I also had a good experience with their customer service. I ordered two bags during a trip to the US at christmas and returned one, customer service was quick to respond to my emails and my refund came through fast enough. I had bought a Danier leather bag during Christmas sales thinking I would use that as my formal work bag, but I find myself taking OMG to work everyday instead.